I did something in Brazil that our mothers warned us never to do. I walked up to a man on the street. He didn't speak English, and I didn't speak Portuguese. But he motioned for me to follow him - and I did - from the street, into a building, and up three flights of stairs. And it was one of the coolest experiences of my life! And that afternoon pretty much summarizes my experience in Brazil from May 26 - May 30, 2016. I was warned by many people not to visit Brazil this May. Here's what I heard: "It's not safe!" "It's the center of the Zika virus!" "It's their worst economy in forever!" "They are impeaching their president and the people are rioting in the street!" But I went anyway, and so did 63 others in the Marathon Tours and Travel group: marathoners from all over North America. About a year ago we chose to run the Rio de Janeiro Marathon as our South American marathon, in our quest to run a marathon on all 7 Continents. Yes, this is a thing. We are a very numbers driven group of people. There were people in our group who had run a marathon in all 50 states. One man ran all those marathons in 2014 (you do the math; just about every weekend). Another man ran a marathon in all 50 states - 3 times. Several of us already run all 6 World Marathon Majors. Many of us qualified for the Boston Marathon - several times. 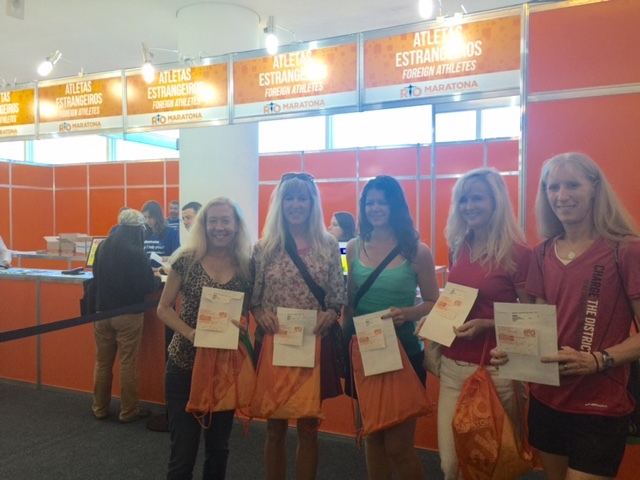 So now this was our opportunity to check running a marathon in South America off our list. We took a week off from work, paid our money, and since the US State Department did not have an advisory against flying to Rio, there we were, at the Caesar Park Ipanema Hotel, right across from the world famous Ipanema Beach. The day we arrived, some of us showed up for the group fun run, and we got an early feet on the street view of our home city for the next 5 days. which is visible from all over Rio. The view from the base of the statue was spectacular. and we drove by a favela - basically, a slum that the government has begun to rehabilitate. 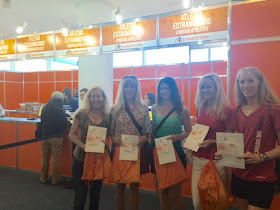 After our tour, we went to the Expo, to pick up our marathon gear and pose for pictures. By the end of the day, our group of women from Marathon Tours and Travel had bonded. Preparing for a marathon does that for people It was as if we were all instant members of the same college sorority. Sheri, Sheila, Barbara, Kristy, Megan - I miss all of you already, and I can't wait to run many more miles with you all over the world. On our own, we went to Sugarloaf Mountain. and marveled at the view of Rio from the top of the mountain. And then - well, that's when everything fell apart. There was no Ann or Jane up there on Sugarloaf to check everyone's names off on a clipboard before we went down the mountain. Our group got separated into 2 smaller groups on the top of the mountain. Each group was first nervous, then scared, that something awful happened to the other group when we couldn't find each other. Were the others kidnapped? Bitten by a Zika infected mosquito? Impeached? Raymond was not going to leave the mountain until he found every last one of us. But finally, Kristy and I realized that we could text each other, using our international phone plans, (which I had almost run through due to my sister in law Devon's posting movies of baby goats on Facebook - how could I not click on those videos?) (the goats were wearing pajamas) (and they were jumping) (and they have little horns on their heads, who knew?) and discovered one group of us was still on top of the mountain, and the other group had made their way to the bottom of Sugarloaf, figuring the first group was down there. Once together, we vowed to never leave each other's sight, except during the marathon, when we were planned to run our own race. Marathon Morning was warm and steamy and humid. The forecast was to remain steamy and humid, but go from warm to hot. We got on a bus (Ann and Jane checked our names off on a clipboard, oh how we could have used their help at Sugarloaf!) and the driver drove us all the way to the start. The cool part was that we got to see most of the marathon course, which would also be much of the same course the athletes will run at the Olympics. The scary part was that bus ride seemed S O L O N G - and the way back was not by bus but on foot! We all hung out together before the start, basically talking while we stood in line for the port a potties, then getting back in line again for the port a potties. This is the part of the marathon you don't see on television for the Olympics. Once we started running, we all felt at home again. This is what we do. A fun part of the marathon was how the runners would talk to each other. Several woman I ran besides tried to talk to me, but my Portuguese was a bit rusty, so I just smiled and nodded my head. This was a very friendly marathon. It was also a spectacularly beautiful marathon. 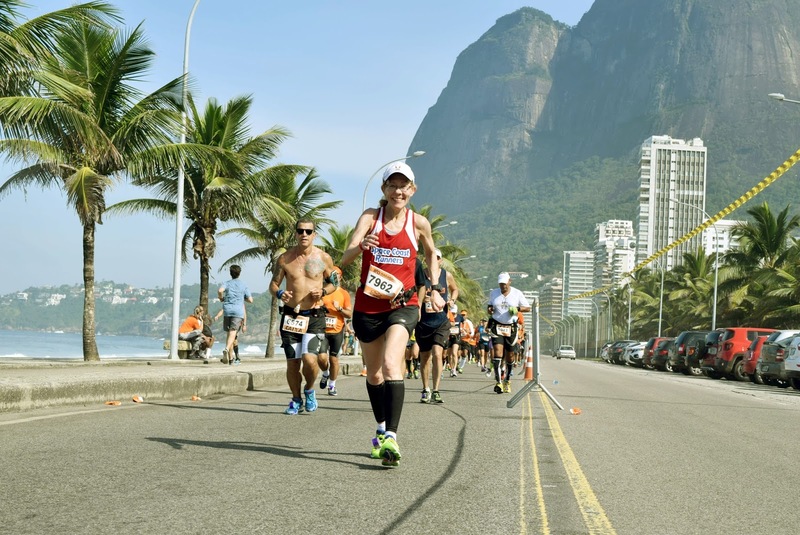 Most of the course hugged the Rio coastline. We ran by the ocean and mountains for most of the run. By the end of the course, the temperatures were well into the 80 degree area. This is dangerously hot weather for a marathon. My friends and I all finished, but we (wisely) went slower then we could have run. were the flags for Marathon Tours and Travel. Ann and Jane were at the finish, organizing us once again, crossing off our names on the clipboard, and shepherding us onto waiting air conditioned buses. I decided right then and there, not only will I run as many marathons as I can with Marathon Tours and Travel, but I want them there in my everyday life. Ann and Jane, with clipboards and buses, organizing my day, my meals, my job appointments, my social life. I'll never get lost again! At the post marathon party, we all regaled each other with our marathon stories. Favorite parts of the marathon included watching the elites run right by us at an out and back turn, and seeing that runner with one leg who was running the marathon on crutches. When we first saw the elites, we non elites clapped politely for them. But later, as we ran by the runner on crutches, the applause from us was so loud it was deafening. What an inspiration he was to all of us, and not only as a runner. How humbling. 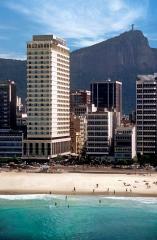 We all had night flights home the following day, which gave us more time to savor Rio. Raymond had us jumping for joy (like the baby goats!) on Ipanema Beach. After Raymond left us (he was off to go volunteer at a favela teaching computer skills to the students there, what an wonderful experience that turned out to be for the kids - and for him!) we walked down the beach and met two new friends, Ipanema lifeguards Paulo and Paulo, who graciously agreed to pose for pictures with us. And then somehow we talked Morgan into joining us for some shopping! He definitely wins the good sport of the year award for joining the Girls from Ipanema on our quest to get Olympic shirts and coins. Morgan's reward was the experience described above at the beginning of the post. Morgan joined me and Sheila and Barbara for lunch. We all decided to look for an authentic Brazilian restaurant for our last meal in Rio. We weren't coming up with anything that looked enticing as we peeked into restaurants along Ipanema Beach. And then we saw him - a man standing by a building with a large sign covering most of his body. Most of the words were in Portuguese, but the few English words we could read advertised a typical Brazilian homemade lunch. My three friends, all Certified Public Accountants, decided the credits outweighed the debits, and followed the sign man, who was signaling with his hands as to where we should go. I followed. As we climbed up three sets of elevators in an upscale urban mall, with no signs of restaurants, one of my American CPA friends, I think it was Barbara, said, "we are either going to a great restaurant - or we are going to a slaying." The other two accountants and I, the lawyer, already projecting ahead to the criminal trial of the sign man for our deaths, shook our heads in agreement. Suddenly the sign man stopped in front of a small family restaurant, smiled at us and pointed to the door of Puro Salor de Ipanema. There we enjoyed a wonderful, delicious, family style meal of traditional Brazilian food. As we got up to pay at the desk at the front of the restaurant, I noticed a large framed shadow box behind the cash register filled with medals - running medals, from races ranging from 5K races to marathons. I asked the man taking our money whose medals those were, and he, "the owner, he is a runner." "We are too!" I said. "We all just ran the Rio Marathon!" The man taking our money broke into a large smile, left his post, and went into the kitchen and grabbed the Puro Sabor's owner, who spoke to us in broken English, translated by his employee. Turns out the owner is a runner of many races, including a PR in a marathon in about the 2:30 range. We all spoke to each other, and through the employee, about the Rio Marathon and how great just being in Brazil was for all of us. So, not a slaying, but one of the coolest experience of my life! The people who warned me not to go to Rio were right - this is a challenging time for this beautiful city and country. But - in life we take calculated risks, and flying to Rio to run the marathon was a risk well worth taking. I met friends who are all amazing women and men who I hope to run with again and again. I was moved by the spirit of the Brazilian people in a difficult time for their country. And then there was that runner at the finish line. I don't know his backstory. It could be one of overcoming a terrible illness, or perhaps he was running in memory of someone who had died. Or maybe, for one moment, he let go all the sad parts of life, and just celebrated being alive and happy to have run 26.2 miles. 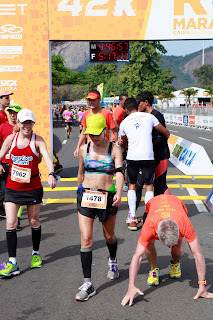 In that instant, when I watched him kiss the ground after finishing the marathon, all I thought of was happiness at everything that had happened to me in Rio. It was a perfect moment.